BookRenter, online at bookrenter.com, is the source for cheap college textbooks. 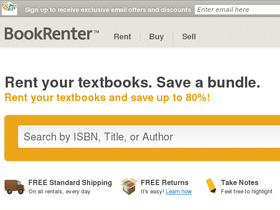 BookRenter makes education more affordable by offering discounts up to 80% with textbook rentals. BookRenter also sells cheap used textbooks and buys books from students, helping students study more and stress less. BookRenter offers biology books, chemistry, accounting, medical books, law books, advertising and promotion books, media books, history, and tons more. So find the books you need and save with BookRenter, and be sure to get all the latest BookRenter.com discounts, BookRenter promotions, and BookRenter coupon codes found here at RetailSteal.com. BookRenter ships within the United States, including Alaska, Hawaii, and P.O. Boxes. BookRenter offers free standard shipping for purchases within the continental United States. See site for shipping options and rates. Shop at BookRenter and enjoy 5% savings on 3 rentals and Free Shipping. Click here for code. Shop at BookRenter and enjoy 10% savings on 4+ rentals. Click here for code. Shop at BookRenter and enjoy 5% savings on 2+ books. Click here for code. Save up to 80% when you rent your books from BookRenter. Click link to find the books you need today. Shop at BookRenter and enjoy free returns on all orders. Click here to shop. Go to BookRenter and enjoy free standard shipping on all textbook orders within the continental United States. Click here to get your books. Sell your textbooks at BookRenter.com and get an extra 12% back when you pick store credit. Click now to sell. Sell your textbooks to BookRenter.com for cash or store credit. Click here to sell yours now.